A brilliant piece of footwork from Omar Kreim set up Frédéric Lajoie-Gravelle for the game-winning goal in the 109th minute, as the Montreal Carabins claimed the first Sam Davidson Memorial Trophy in program history with a 2-1 extra-time win over the Cape Breton Capers on Sunday afternoon at Thunderbird Stadium. 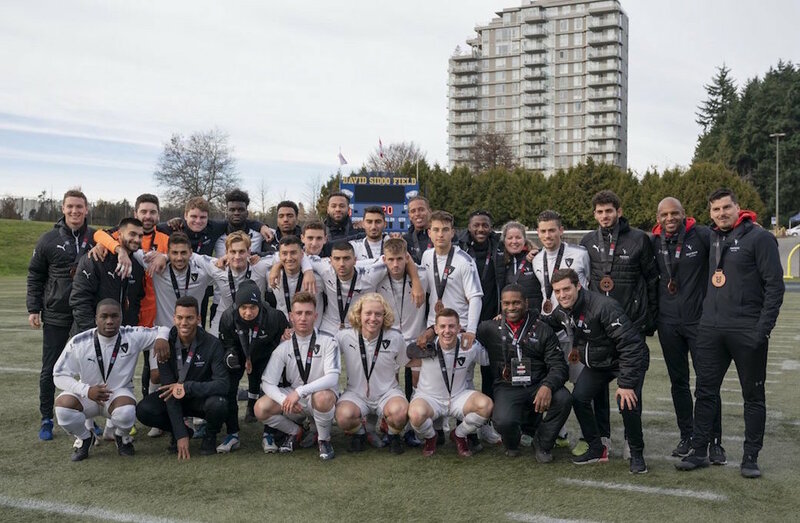 The game was a rematch of last year’s U SPORTS national championship final where the Capers edged the Carabins 3-2 on penalty kicks. Coming in off the right flank and going one-on-one with midfielder Lewis White, Kreim turned the Caper inside-out before going in on goal. There, Kreim waited before laying off the ball to Tournament MVP Lajoie-Gravelle, who scored the most important of his tournament-high five goals on a tap-in. It was a lightning-fast start for the side from Quebec, as it took them just 84 seconds to strike first. Launching a long ball from near midfield, Kareem Sow just managed to put it over the last line of CBU defenders and into the path of Guy-Frank Essomé Penda. The third-year forward wasted no time, putting a one-touch volley in behind Capers keeper Ben Jackson to open the scoring. Marcus Campanile got the Capers’ best chance of the opening few minutes on a free kick, as he delivered a ball that dipped just over the wall, forcing Carabins goalkeeper Félix Goulet to make a diving stop. Joel Eckert-Ayensa was the next Caper to threaten, as the midfielder put some heat behind a 13th-minute half-volley from 20 yards out. Pierre Lamothe had a nice look in the 19th minute, as the rookie found himself in space at the top of the box and narrowly missed curling a ball inside the far post off the left flank. Jackson kept the Capers within one on a couple of occasions in the middle stages of the first half, making impressive stops on both Essomé Penda and Lamothe. 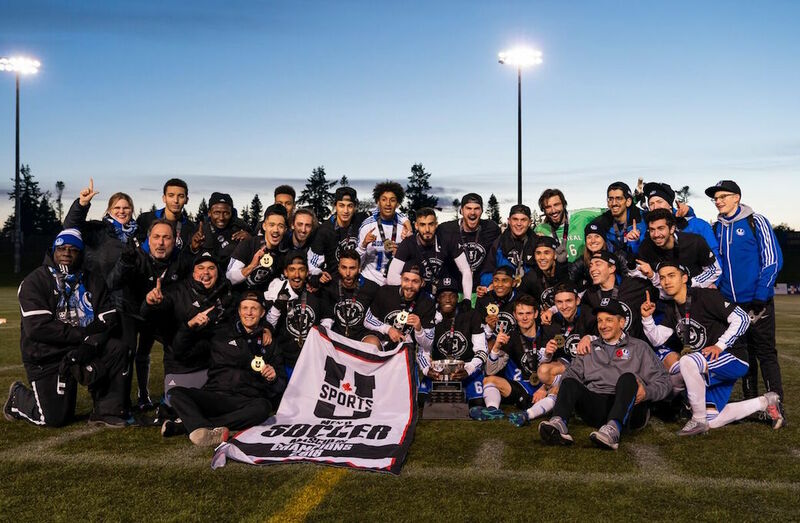 M⚽️ // The 2018 @USPORTSca Men's Soccer National Champions are the @Carabins after a victory over @gocapersgo. Final score: 2-1. Then, with just a couple of minutes remaining in the opening stanza, Caelann Budhoo got Cape Breton on the board. Just sifting his way into the middle of the Carabins scoring area, the midfielder evaded three Montreal defenders before putting a clinical finish in behind Goulet. With the score back even at 1-1, Montreal maintained their aggression well into the second half. Generating 12 total shots in the second, five of which came off the foot of Lajoie-Gravelle. The 60th minute saw Cape Breton earn their best chance to pull ahead. After Goulet charged out of his goal to punch the ball away from a darting Corey Bent, Stuart Heath was left with a wide open goal on the rebound. The Capers captain couldn’t get his foot on it properly, as his volley flew well over the bar. In the 75th minute, Grayg Noireault hit Zakaria Messoudi in stride, and the forward volleyed it past Jackson, put it straight off the crossbar and out. Jackson, who totaled six saves in the second half alone, saved his best for the 88th minute. Still knotted at 1-1, the Capers keeper rose high on a rising strike from Massoudi to just barely get his fingertips on it. Jackson then had to run down the rebound before an onrushing Lajoie-Gravelle could close. The most influential moment in the first extra time session wasn’t a chance on either side, but a red card shown to Cape Breton defender Peter Schaale, the reigning AUS Most Valuable Player. Schaale, who was already on a single yellow after an earlier incident, was tossed after hauling down Kreim as he was trying to break away with two minutes left in the period. It was the second Sam Davidson Memorial Trophy win for Raimondo, who also claimed the national championship title as head coach of the McGill Redmen in 1997.